The long awaited release from the British led folk rockers, brings haunting melodies and gritty stories of heartbreak, runaway junkies and death on the trail to the public for the first time. At the heart of Thee Shambels is the songwriting and voice of Neville Elder. A British transplant to Brooklyn since 2001, listen carefully and you’ll hear representations from British and Irish folk music. But primarily his darkly lyrical sound is influenced by the music of Tom Waits and Nick Cave - though as writing influences he also cites Nick Lowe and Townes Van Zandt. He listens to a lot traditional country music such as Hank Williams and Lefty Frizzell. Filter these storytellers through the modern styled crooning of the The Handsome Family and a love of Rockabilly and American roots music and you get the Anglo American sound of Thee Shambels. These four songs on the E.P. 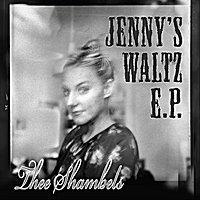 Jenny’s Waltz are a representation of the different styles and themes present in the band’s music. “I love those dark stories from traditional folk music. And I love ghost stories by Poe and HP Lovecraft. All those murder ballads like Knoxville Girl, that’s where ‘Baby’s Bones’ comes from. It’s a straight up ghost story about an man going mad from grief." ‘Jenny Come Back’ is a tragi-comic romp about a runaway junkie mourned by the people she's left behind. A black humored sea shanty like tune that builds into a crescendo in the final verse. “There’s always room for a bit of theatre in my music.” He says of the big waltzing sound. The ethereal song ‘The Girl At The Bottom of the World’ is about a shut in. ‘The Road To Hell’ is a song about falling for the wrong girl. Sometimes we’re drawn to people who are wrong for us. But unable to resist: the connection is so strong. It becomes a push-pull affair. "This song’s about coming to that tipping point." Neville’s photography and design all come together to suggest a darkly romantic and entertaining record that should sit nicely in your collection nestled between the likes of Gogol Bordello, Neko Case and The Decemberists. I love it! "Barbara Allen" for the Age of Information. But at this point I'm so puke sick of hip hop and all those tremolo-voiced silly soul sisters that EVERYTHING else sounds good. BTW, please correct the Townes Van Zandt typo--he remains a god to most of us.